Yes, yes; the entry door is important because it is the very first thing onlookers notice when they arrive at your home. It is, in fact, a major aspect of your home because of its focal-point nature and its dual duty as first-line security for your family. That said, you will want to choose wisely when selecting an entry door for your Brampton house—but there is more to it than to worry solely about style and security. What about choosing the right door for the climate you live in? These doors are great in bad weather: thunderstorms, strong winds, hurricanes. The value is in the name: steel. Steel entry doors are strong, they provide security, and they look beautiful doing just that. As a bonus, they add a level of safety and security to your home that any family would want. Should an intruder try to enter, steel is not an easy material to kick down. There’s a slight downside to steel doors if you live in a highly sun-exposed area: they get But, if you’re in a wooded area or have a good overhang as part of your entryway—steel is an ideal option! For those homeowners in more humid climates who love the natural-looking entry door, fiberglass is an excellent, practical option. Fiberglass doors can be made to look just like a natural wood door, without the maintenance. This material will not warp or rot or deteriorate from the weather and heat. Do you live near a body of water and experience intense humidity during certain times of the year? Worried about the rainy season affecting your entry door’s lifespan? Consider a fiberglass door through We can even stain it to match your favorite wood—oak, cherry, etc. Further, fiberglass also is an incredibly strong, safe door to ward-off intruders. Where you live can and should help guide your decision when you’re choosing a new entry door for your home. Here in Brampton, ON, and the surrounding cities, either of these door options may be a good fit for your home. Consider your surroundings and the weather trends here in Ontario—and then consider what’s most important to you in an entry door. 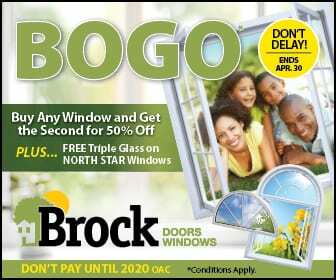 Here at Brock Doors and Windows, we want to see your home serving you. Give our team a call to set up a free in-home consultation. We would love to work with you on your next replacement or renovation project!